Years ago, a chronic power outage in the pavilion and a hundred cups of coffee triggered a bright idea. If I had a golf cart, my staff and I could drive the hot pot to the kitchen to brew. Instead, I trudged uphill, the shortest distance between two points, with the huge percolator. Never again, I vowed, as sixty farm girls huddled together on a cold September morning, yawning for caffeine, waiting for my Farm Girl Revival to begin. The following spring, Andy, our late handyman, rewired the inadequate electrical lines. Afterward, we found a used golf cart. I paid more for that little sprite of a vehicle than my husband did for our first car. Oh, what a happy day when Andy and his wife, Kathy, pulled into our driveway with my lifesaver. He rolled my $2,600 expense off the flatbed and up to the front porch where I stood. He looked sheepish. Andy flipped up the cart’s back bed and took a seat. I say unequivocally, many farm burdens lifted that day. 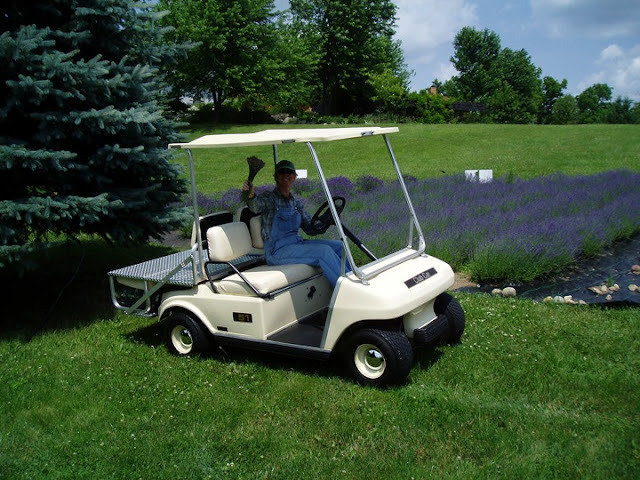 I learned to spare my body and use my "old fart cart" for transport upon the property’s rolling vistas. Andy made a frame for the bed to secure my garden tools, potted plants, and containers of lavender scones, brownies, and ice cream—and bags and boxes of lavender products for the gift shop. When the hens came along, my husband wheeled their feed downhill to their house. After we closed the farm to the public, for some unknown reason, the name Betsy came to mind. Perhaps it was after she helped us transfer the freezer and refrigerator from the pavilion to the basement. No job for an old fart. Truly, we couldn’t maintain this place if it wasn’t for Betsy’s tough little spirit. Surprisingly, the highlight of our grandson’s visits is driving our golf cart. “Why do you call it Betsy?” he once asked. It was last week when I piled bags of dirty, torn, and stapled weed cloth onto Betsy’s bed and realized the answer to his question. That cute little thing reminds me of my grandmother-in-law, Betsy. She worked and played with her entire heart. After eight years of strenuous labor, it seems Betsy enjoys our part-time retirement. On occasion, I take her on farm inspections, no burden to carry but me. She’s become a part of our family and memory, as did my husband’s 1975 Mustang, and our Valero station wagon as parents of three little girls. Betsy’s big chores this spring and summer are to deliver hundreds of dead lavender plants to the fire pit, and old weed cloth to the road for trash pick up. Come August and September, I’ll pack her up with vegetables from the garden. Today, dear Reader, my workhorse carried three packages of honeybees to their hives. For Betsy and me, it’s pure recreation to welcome bees and queens to their new home. I understand why Andy and Kathy didn't want to let Betsy go. She's got personality. And a work ethic that won't quit.